We offer an assortment of pullers sized for the extrusion of micro tubing up to 8" diameter pipe, with tire, wheel and belt configurations. Our belt pullers for profile range from 2" wide x 15" contact length up to 6" wide x 32" contract length. All models typically have AC Vector motors for brushless operation and are manufactured in Fulleron, CA. Please contact the factory for additional information. Model AB-40: 4" maximum opening, four wheel puller. Typically used for small profile, tubing, and pipe. Our most economical tire/wheel puller. Model 400: 4" maximum opening, four tire puller. Pneumatic tires enable greater gripping capability over our AB-40 and allow for enhanced traction of rigid pipe extrusion. 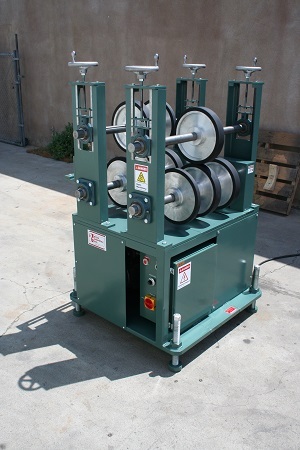 Manual handwheel control of top and bottom tire banks. Model 450: 4" maximum opening, four tire puller with manual adjustment of top tire bank and independent air cylinder control of bottom tire bank. 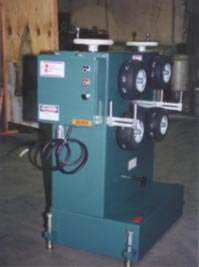 Similar to our Model 400, but allows for a more measured pressure on the extrudate utilizing the adjustable air bank controls. Model 872: 8" maximum opening, four tire puller with air cylinder control of top and bottom tire banks. All four wheels gear driven. Top wheels manually adjustable. Bottom wheels air loaded independently for measured pressure on extrudate. 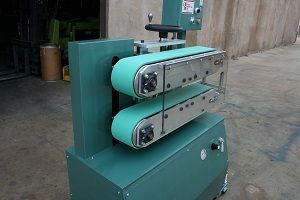 Model PV200: 0-2" capacity opening, 2" wide belts, 15" contact length puller with air cylinder control of bottom belt. Top belt manually adjusted via handwheel. Bottom belt air loaded via single air cylinder for measured pressure on extrudate. Ideal for small tubing and profile. 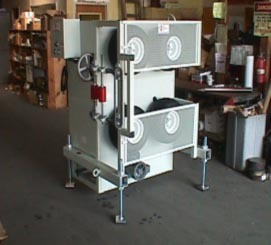 Model PV400: 0-4" capacity opening, 4" wide belts, 32" contact length puller with air cylinder control of bottom belt. 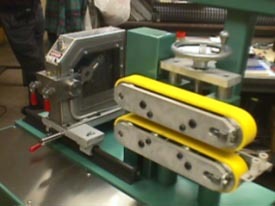 Top belt manually adjusted via handwheel. Bottom belt air loaded via single air cylinder for measured pressure on extrudate. Ideal for use with tubing and profile requiring vacuum processing for part and size stability. 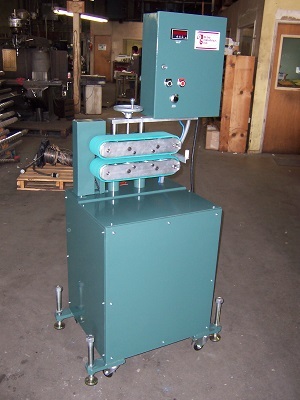 Model PV406: 0-4" capacity opening, 6" wide belts, 32" contact length puller with air cylinder control of bottom belt. Top belt manually adjusted via handwheel. Bottom belt air loaded via a single air cylinder for measure pressure on extrudate. Ideal for use with large profiles requiring vacuum processing for part sizing and stability. 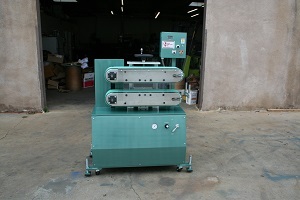 PV212SPC: 0-2" capacity opening, 2" wide belts, 15" contract length puller. 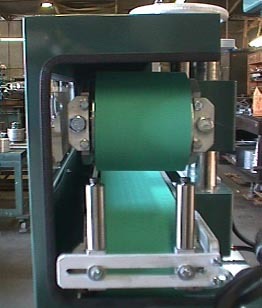 Top and bottom belts manually adjusted via single handwheel control. Servo motor and processor for precise puller speed and length count. Servo motor and processor for cutting application coupled to puller frame with hardened slides for ear of cutter movement. No gearboxes or clutches. Blade holder fixtured directly on servo motor shaft. No moving parts to wear or replace. Ideal for small tubing and profile. Digital touch screen micro-processor for input of puller speed and extrudate cut length.